Over 300 IT Fleet Automotive staff, friends and family embarked on the company’s annual summer BBQ amid the blazing July sunshine for a fun-filled afternoon, including a visit from IT Fleet’s chosen charity for 2012 – the Essex and Herts Air Ambulance. The crowd were treated to an impromptu aerobatics display from Danny Williams, IT Fleet’s CDR Specialist, as well as a guided tour of the lifesaving MD902 Explorer helicopter by its pilot and Essex and Herts Air Ambulance medical crew. The site was awash with smiling children, mums and dads as they enjoyed live music from band Skandal, a freshly prepared hog roast and multiple games and activities that kept everyone entertained throughout the day. 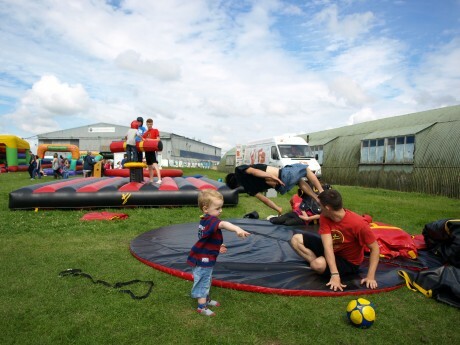 Activities included playful Sumo wrestling, a hilarious bucking bronco, bungee running, inflatable gladiator jousting and the slightly more sedate activity of face painting. Andrew Timmis, managing director at IT Fleet Automotive, said: “Our annual summer BBQ is always a perfect way for staff and their families to socialise outside of work. We are one big family at IT Fleet Automotive and it is therefore important that we put on an event like this every year to show our appreciation and thank them for their efforts. View more photos from the Summer BBQ at our Facebook page. With a rewarding working environment for all of our employees why not play your own part in the future of IT Fleet? Browse our latest open job vacancies and see if there is anything available that suits your skills.